Environmentally friendly Oxystrip is the safest rust remover on the market and also non-toxic the report says. For those wondering how to remove rust from tools, cast iron, metal, or other surfaces, a new report from Planet Amazing shows the benefits of a new rust remover product called Oxystrip, including the quick 10 minute treatment time and safe non-toxic, environmentally friendly status as an EPA approved rust remover. This non-toxic product is the safest rust remover on the market the report says. "Removing rust is easier than most people think," says Justin Douglas of Planet Amazing. "Rust can now be easily removed from toys, tools and machinery, as well as household surfaces and concrete, with the new Oxystrip rust remover liquid from Planet Amazing," he says. "Oxystrip also protects the surface for the future. It works in about 10 to 15 minutes. Apply Oxystrip to a rusted surface. Let it penetrate for 10 to 15 minutes and rinse the surface. Oxystrip contains special additives to prevent further rusting." "Oxystrip can be used on metals, automotive parts, toilets, tubs, tile, concrete, metal siding and machinery," Mr. Douglas explains. "Rusting of metals is caused by a process called metal oxidation. In short, the surface of the metal is deteriorated by chemical reactions inherent to the chemical composition of the metal. Water and salts are the main culprits in the oxidation process. Rust can be a problem with cement, clothing and carpets which have been in close proximity to rusting metal." "For metal to rust, two reactions must occur," Mr. Douglas says. "Metal to metal ions and electrons must be converted by oxidation, and a second reaction in which electrons are consumed by converting oxygen and water to hydroxide ions. In order for these reactions to occur, the electrons must be transported from the place where the metal dissolves to the place where the oxygen is consumed and an ionic current must also flow between the sites to complete the circuit. This ionic current flows more easily through water containing electrolytes such as salt. That is why rust occurs more often in areas with salt in the environment. When used according to instructions, Oxystrip is completely safe and effective. Never worry about the destructive and unsightly effects of rust again. 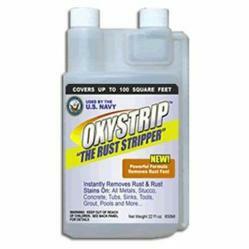 Oxystrip is the rust removal solution." For more information on Oxystrip rust remover, visit the Amazon.com Oxystrip rust remover page. Planet Amazing creates family-friendly and environmentally safe products. Planet Amazing sets high standards for their operating companies in the area of environmental responsibility — striving for performance that does not merely comply with regulations but reduces the environmental impact. They commit to take care of the planet and preserve its beauty, resources and strength for future generations. Planet Amazing embraces research and science - bringing innovative ideas, products and services to advance the lives and well-being of people. Employees of the Planet Amazing Family of Companies work with its partners in order to touch the lives of people every day, throughout the world.